New York is preparing for the potential closure of the Indian Point nuclear power plant by investing in demand reduction, on-site energy production, and energy storage. The Combined Heat and Power (CHP) Acceleration Program from NYSERDA is part of this effort. CHP provides resiliency in case of power outage. Because the equipment runs 24/7, it is likely to continue operating during an emergency, as long as natural gas supply is not disrupted. Backup generators, on the other hand, risk not starting when they are needed and generally do not have the fuel to operate for days at a time. 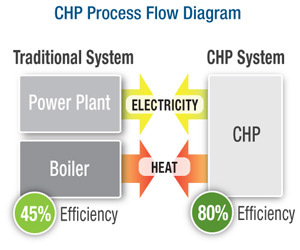 For commercial buildings over 50,000 square feet (5000 square meters), multifamily buildings with more than 200 units, and buildings that have a high hot water demand, CHP is economical, especially with state incentives. In smaller buildings with Passive House levels of efficiency, however, it may make more sense to disconnect from the natural gas connection to avoid fossil fuel use. Providing hot water using direct electricity is more efficient within a renewable structure. [2014 PHI Conference Proceedings P. 651] Domestic hot water tanks heated by air source heat pumps can act as energy storage for a renewable smart grid infrastructure. More information about installing CHP microturbines in NYC buildings. Currently CHP relies on natural gas supplied by utility companies. However, there is a potential synergy with a new technology called Power-to-Gas (P2G). P2G is useful for seasonal storage of surplus renewable energy. With P2G the amount of methane gas required for a typical house would be about 3.5% of the amount of natural gas equivalent (fossil energy) currently consumed. [2014 PHI Conference Proceedings p.641] Why not use biogas? Biogas is problematic because it requires a lot of agricultural and forest land that could otherwise be used for food, raw material, and transportation fuel. Renewable energy is likely to continue its fast growth. In fact, the investment bank UBS sees residential PV as a huge growth market in the near future, even though utility-scale PV is less expensive per installed peak watt. As onsite PV energy production becomes more common, there will be a challenge with overproduction on sunny days and the need to use energy from storage at night, especially during cold winters. A change to New York State’s utility structure may be needed to address the cost of renewable energy storage and transmission. In addition to energy storage, one solution is to use onsite PV energy as much as possible before exporting it to the grid. This has been called—a little inelegantly—self consumption. German architect Kay Künzel presented his self-consumption strategies at a New York Passive House presentation on February 27, 2014. His home automation system timed certain appliances to run during the day to take advantage of direct PV energy. Another self-consumption strategy is to use DC power as much as possible to avoid the DC-to-AC inverter losses. New York City recently passed the Zone Green amendments which make installation of solar panels easier, although in order to qualify for New York property tax rebates for installation of solar panels, you will need to have a registered architect or engineer file with the Department of Buildings. To calculate the photovoltaic potential in your location and to get information about incentives, use the PV Watts calculator. Duncan Architect can help you create buildings that are energy-efficient and resilient with onsite renewable energy where feasible. Email greg@duncanarchitectpllc.com for more information.